The famous fairy tale of the Beauty & The Beast has been picked up in this Yggdrasil slot. 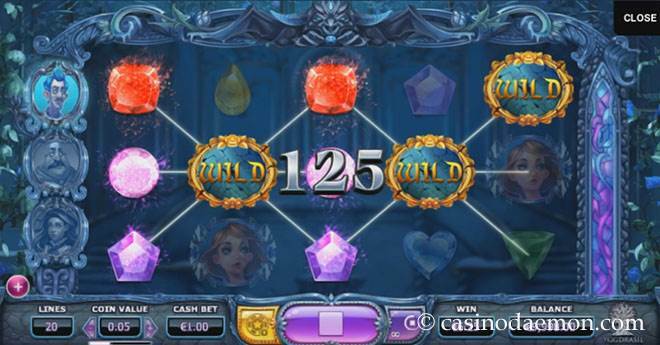 The game has some interesting features, especially the free spins with up to three combined boosts and the Golden Bet are worth taking notice of this game. The graphics are beautifully drawn, and the music also complements the game very nicely. The variance of the game depends on how it is played and can be lower or higher. Selecting the Golden Bet feature and your choice in the free spins affect how much and often the game pays out. Similarly, the theoretical return to player is also affected by this and ranges from between 96.3 to 97.1%. This is a game that is best played for a little while, at least until you start the free spins. If you just want to play a few rounds, or you want a game with smaller stakes, this is probably not a game you should play. 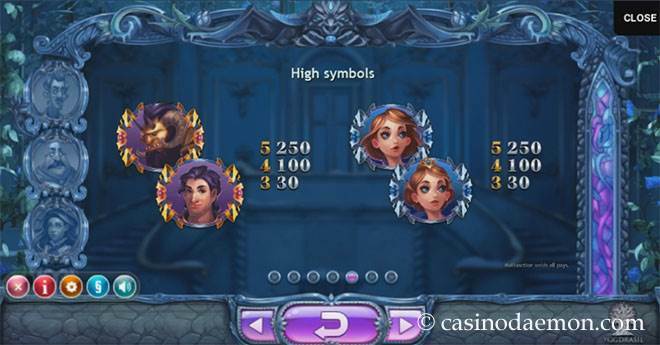 You can also play Beauty & The Beast mobile on iOS, Android and Windows devices, as the game has been created in HTML 5 and is compatible with many different devices. 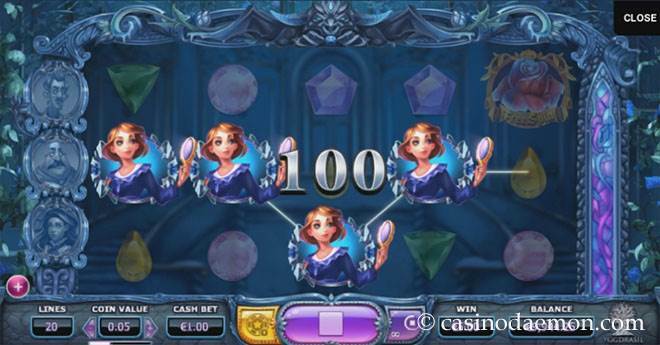 Here you can play Beauty & The Beast slot for free and try out the game without any obligation. If you want to try your luck for real money you can find it at one of the online casinos mentioned on this page. Rose Boost: costs +5 coins per spin and allows you to win more during the free spins, as you start them with two boost features. Bell Nudge: costs +15 coins per spin and allows you to enter free spins more often, as the Nudge activates in the base game if free spins are possible. Crown Boost & Nudge: costs +30 coins per spin and combines the two previously mentioned feature boosts. This is by far the most expensive boost, but it can potentially yield the highest winnings. The wild symbol of the game replaces other symbols for winning combinations but it doesn't replace the scatter symbol. The Butler: he can nudge one reel up or down by one position to create the best possible winning combinations. The Chef: he will synchronise the three centre reels so that they all show the same symbols. The Maid: she will place 2-4 random wild symbols on the screen in each free spin. The best thing about these free spins is that they can be re-triggered. Each time you re-rigger them you can select another boost feature, and they will be combined for a the next free spins. Each time the spin counters is reset to 10 free spins. 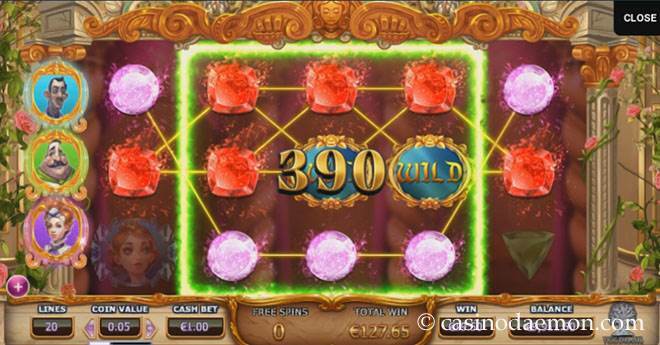 The highest possible winnings are achieved when you manage to combine all three features during the free spins. The Beauty & The Beast slot has 5 reels with 10 fixed pay-lines. You can select coin values from between 0.01 up to 1 £/€/$. The minimum bet per spin is 0.20 £/€/$, and you can raise your wager up to 100, or even 250 £/€/$ with the Golden Bet. You can activate the Golden Bet which raises your stake by either 5, 15 or 30 coins. You can also play the game with automatic play options.